Secretary of Administration Jeb Spaulding announces that Patricia Moulton Powden (left) will take over as secretary of commerce and Lawrence Miller (right) will become chief of health care reform. Gov. Peter Shumlin’s Mr. Fix-It is taking charge of the administration’s sprawling health-care reform overhaul. Replacing Miller at the helm of the Agency of Commerce and Community Development will be Patricia Moulton Powden, a former deputy secretary and longtime state government official. “The governor felt that, since he’s so serious about getting universal, publicly financed health care in place here in Vermont as quickly as we can, that we needed to strengthen out team,” Secretary of Administration Jeb Spaulding said Thursday afternoon at a Montpelier press conference at the agency’s National Life Building headquarters. The founder of Otter Creek Brewing and a former CEO of Danforth Pewter, Miller is seen in Montpelier as one of Shumlin’s most trusted and competent confidantes. 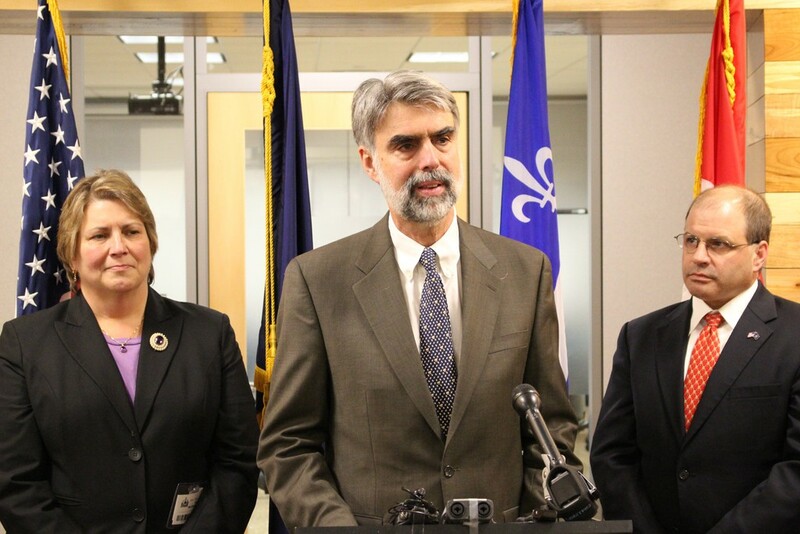 In January, the governor tasked him with fixing the technological, organizational and political problems facing Vermont Health Connect, the troubled health insurance exchange. In his new role, Miller’s portfolio will include not just the exchange, but the administration’s ambitious health care payment reforms and the design of a universal health care system. Thursday’s announcement appeared designed to reassure two key constituencies with major questions about Shumlin’s health care reform plans: the legislature and the business community. In the legislature — particularly in the Senate — many have grown uneasy about the prospect of raising perhaps $2 billion in revenue to finance Shumlin’s proposed single-payer system. Unlike Shumlin’s current crop of health care advisers, who were tainted by the flawed rollout of Vermont Health Connect, Miller commands legislators’ respect. He’ll join Floyd Nease — a former House majority leader who Shumlin assigned in February to lobby the legislature on health care issues — in making the political case. Moulton Powden, meanwhile, is “somebody that has got instant credibility in the business community,” Spaulding said. A commissioner of labor in former governor Jim Douglas’ administration, Moulton Powden worked briefly for the Vermont Chamber of Commerce before joining the Shumlin administration as deputy secretary of commerce. She left the agency in January 2013 to run the Brattleboro Development Credit Corporation. In her remarks at Thursday’s press conference, Moulton Powden made clear that she, too, plans to play a role in health care reform. According to Miller, many are concerned about “runaway cost increases” in the health care system, but they’re also worried about the “unknowns” of reform and the transition to a new regime. “The real concern areas are less around where we might be when we get there than around how are you going to make sure you manage the risks in the transition,” he said.